SINGAPORE - Business sentiments among local firms remain muted despite inching upwards slightly for the third quarter of this year. According to the Singapore Commercial Credit Bureau (SCCB)'s latest quarterly Business Optimism Index (BOI), released on Tuesday (May 31), confidence was stuck in the near contractionary zone for the fourth consecutive quarter. Ihe index edged upwards from +0.89 percentage points in the previous quarer to +1.11 percentage points for the thrid quarter. On a year-on-year, sentiment was sharply down, falling from +14.60 percentage points for the third quarter of 2015 to +1.11 percentage points. 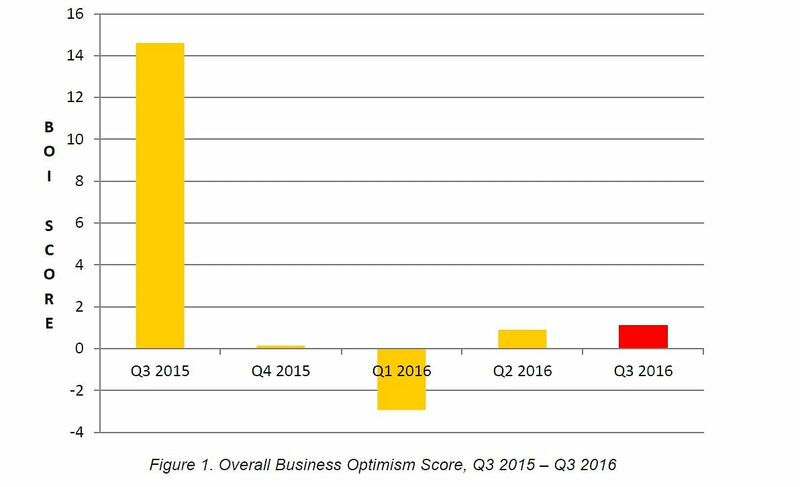 Overall business confidence remains flat despite the marginal uptick, said the SCCB. For Q3 2016, only 2 of six indicators were expansionary. The construction sector emerged as the most optimistic sector with 4 indicators in the expansionary region while the manufacturing sector was downbeat with 3 of six business indicators in the contractionary region. The services sector did not escape the doldrums, as confidence fell with consumer retail activities expected to remain weak. According to SCCB, 3 of six business indicators declined into the contractionary region for Q3 2016. Released quarterly, the BOI is based on a survey that is designed to capture business expectations and is one of the most effective ways to track how the business community perceives the business environment, and where they think it is moving, said the SCCB. The index tracks business parameters including net profits, selling prices, new orders, inventory levels, and employee count.